How often do you get to share a room with somebody who invented a refrigerant? And have the opportunity to ask them questions? You will at Wire & Gas 2015. Attendees will join an elite few to receive knowledge and understanding of R1234yf directly from an engineer who played a key role in the new refrigerant’s development. 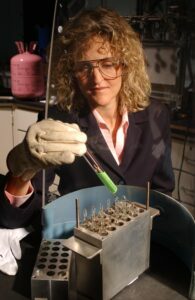 Barbara H. Minor is senior engineering fellow at Chemours (a subsidiary of DuPont) in the USA, and led the development of several low global warming refrigerants for refrigeration and air conditioning applications, including R1234yf for automotive. She holds more than 130 US patents, has her name to numerous publications and is an active member of refrigeration societies including ASHRAE and AHRI, including chairing the AHRI Research and AHRTI Technology and Steering committees. Barbara will deliver a presentation at Wire & Gas and be available to answer in-depth questions about R1234yf.